Venezuela is a rich country: the largest known world oil reserves sit under its soil, vast quantities of gold and gas wait to be extracted and sold. Yet 87% of its population languishes in poverty. The country is facing huge instability brought about by a crumbling economy, and the instauration of a semi-dictatorial regime by Hugo Chavez´s heir Nicolas Maduro. We are witnessing this paradox with amazement and rage, as the country is now a virtually lawless land being pulled apart and influenced by internal and external players. It is important to understand that I consider the current situation in the country as a disgrace both locally and internationally. The lives of millions of Venezuelans are being gambled with by high flying bureaucrats in Washington, Beijing, Moscow, Habana and the military barracks inside the country. Let us state clearly that all talk of humanitarian aid, concern over political freedoms and human rights coming out from international players is completely void and their interests are almost exclusively focused on tangible interests or as my German friends call it: realpolitik. Venezuela is at the moment a sample case of a global power grab between the US and China that is, I believe, developing into a new world rivalry. Currently both Mr. Maduro and the leader of the opposition Mr. Guaido are claiming the right to the country´s presidency after the international community didn't recognize the last presidential elections due to huge fraud allegations. In the midst of this crisis, the US has been a staunch supporter of Mr. Guaido, while the Maduro regime is being propped up by China (assisted by Russia and Cuba), and its new determined yet quiet campaign to open a strong area of influence right in America’s doorstep. I consider that two main elements are driving the current instability and veiled confrontation between the US and China and its allies in Venezuela. Firstly, control of exploitation and use of the countries immense oil reserves are of key importance in a scenario of more direct economic competition between Washington and Beijing. Secondly, the unipolar world order of american hegemony that has existed since the end of the Cold War is being further challenged. The possibility of further control and interference in the region by another power comes as a huge blow to the US. Over the past 20 years American trade with the region fell from a 53% in the year 2000 to less than 39% today. China and its ally Russia stepped into the region, and especially into Venezuela in the early 2000s as American foreign policy began to be more exclusively focused on the Middle East and terrorism. The US had been losing interest in the region since at least the end of the Cold War, and the possibility of communist proliferation there ending, so a power vacuum formed. As Americans died in endless campaigns in the Middle East, the Asian giant poured over the course of the following decade over 62 billion dollars in loans and investments into Venezuela according to the CSIS (Center for Strategic & International Studies), securing a vast stake over the world´s largest oil reserves. To date, China is Venezuela's largest creditor and this came with a few strings, as Chinese influence became evident. At the same time, the Russians signed huge oil and gold contracts with the regime at a bargain price due to the precarious economic situation of the country. The country is a sample case of what could happen if we see a more direct presence of Russian and Chinese influence in the region, as for the first time in over 200 years the apparent next world superpower is neither democratic nor does it have any regard for human rights. There is a vast threat to democracy and the Western way of life that many of us are used to across the world. The Chinese strategy of debt dependency and advancing itself as the regions first trading partner comes with huge strings attached as we can see in Venezuela and its Beijing supported crackdown on democracy and basic rights, the silencing of the press, jailing of political opponents and control of the judiciary are all now commonplace. This could be a mirror lens into the future as to what could happen if Russian and Chinese influence are not countered by the West. 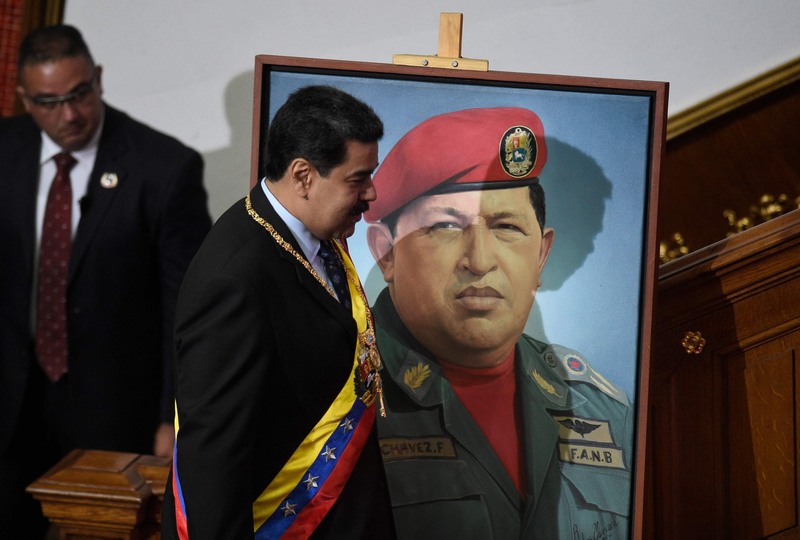 Venezuela is in itself a paradox, as its leader Mr. Maduro has long followed the political line of standing against “The American Empire” set by Hugo Chavez and other Latin American populist leftists. This rhetoric dug its heels on national sovereignty and strong opposition and disdain for American capitalism and free market economy. Yet Venezuela traded their once American “masters” for the influence and interference of US opposed nations: China, Russia and Cuba. This influence came in many forms. As the dictatorship begun to take shape, Habana´s assistance in training intelligence services to suppress opposition dissent and to maintain a functioning health system became vital. As early as 2001 both nations signed broad and ambiguous bilateral cooperation agreements that allowed the island to operate at various levels of the Venezuelan government. This cooperation saw tens of thousands of Cubans positioned at key posts in the country, including intelligence and military circles. The price for the “advice” provided by the Cubans on the instauration of a totalitarian regime and control of the opposition, was selling Cuba over 100.000 barrels of subsidized oil a day that is then refined and resold by the island accounting to more than 20% of its GDP. As American foreign policy was occupied elsewhere, the Chinese foreign policy idea of reintroducing a multipolar world scenario begun to be implemented with Russian and Cuban cooperation. This ideological premise was followed by a more tangible and ever-present need to secure the countries growing energy needs to feed its economy. In this sense, the country soon became a victim of a similar Chinese tactic in the region. This consists in the purchase and further demand of huge quantities of natural resources and food products that serve as a huge incentive to maintain the region´s dependence on the export of primary products, leaving their economies more vulnerable to fluctuations of international commodity prices, in this case, oil. Venezuela's oil addiction became such a grievance that to date 98% of foreign export earnings come from it, and over 50% of its GDP, so oil deals with China and Russia became ever more important for the regime. Venezuela is now another area of hostility against the monopolar world of American dominance that begun to set in as the Cold War ended. By supporting the first democratic and then increasingly authoritarian “Bolivarian” government, China, Russia and Cuba not only gained access to huge oil reserves but also created another outspoken critic of the US, with Hugo Chavez notably comparing former president Bush to “the devil”. I believe that this scenario could have been avoided if the US had had a more tangible and realistic policy for Latin America that realized the risks of an ever-growing Chinese economy. The country and the region is now again a source of interest for American foreign policy, yet this rash and ill-timed stance responds to, I believe, failing American campaigns in the world (Afghanistan comes to mind), and the need to get a quick win in the eyes of American voters and the world. American foreign policy foolishly let slip a dictatorship in the making in the early 2000s that was being supported by anti-democratic and repressive states in an otherwise region of democracy. At the same time, control of Venezuela's oil could now lay in the hands of a new American adversary, which aims to position itself as a potential rival superpower: China, and as the 2018 “US National Defense Strategy” states countering the Asian nation and Russia are now its key priorities. In the middle of this power play, a terrible precedent could be set in the continent. The Trump administration has openly recognized the possibility of a military intervention in the country. The idea of an open international interference in the affairs of a sovereign nation being floated around in a region that has been largely free of interventions and power grabs for more than 30 years is a horrendous and wrong idea that could cost Venezuelans dearly. The current crisis in the country can be explained by both internal and external factors, but it is important to understand that the South American nation now lies at the heart of an international geopolitical confrontation that could allow us some insight into the future. I believe that Chinese foreign policy interests aided by other partners such as Russia and locally Cuba are a terrible sight and precedent for democracy and the rule of law. Venezuela is a sample case of, what I believe, is a myopic American foreign policy driven by the ghostly enemy of terror that let the advocates of authoritarian and realpolitik sweep into various areas of the world including Latin America. Even though any solution to the gross humanitarian crisis in Venezuela needs to stay clear of a military intervention, there is, I believe, a great need to counter Chinese-style policy for the good of our way of life. The crackdown on democracy, jailing of opposition members, silencing of the press, and nationwide domestic surveillance are all textbook Chinese and Russian policies that are being applied in Venezuela. If we do not wish these policies to take root, then a comprehensive approach needs to be taken, firstly in Venezuela and then in the region to solidify democracy and the rule of law that has existed here for more than 30 years.